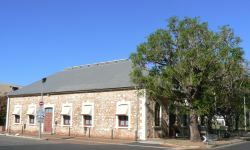 Darwin historic sites -Lyons Cottage (British Australian Telegraph House) and Browns Mart. Located on the corner of Knuckey St and the Esplanade, Lyons Cottage was the only stone residence built for thirty years in the new settlement. Constructed of locally quarried porcelanite stone is the only remaining colonial bungalow style building. It is only a five minute walk from the City Mall and filled with photos and descriptions of life in the early years of the city. Another early stone building, Browns Mart is located in Smith Street next to the city bus interchange. Originally built in 1885 as an emporium and market, it now serves as a theatre and art centre. Over the years it has been used as a mining exchange, bank premises, auction rooms, crown law office and police headquarters. Darwins Living History - as told by the people that were here in years gone by. Return from Darwin Historic Sites to Enjoy Darwin Home.